Strong virtualisation support, ThinOS for security and an attractive full-HD display make the Wyse 5213 a suitable option for image-swap-happy IT departments. 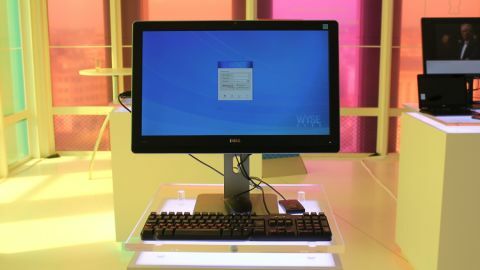 We managed to steal a peek at the new Dell Wyse 5123 all-in-one (AiO) thin client at the company's Solutions Summit in Brussels. Part of the Wyse 5000 Series, the machine is essentially the same as the Wyse 5212 AiO thin client that came before it, only with added ThinOS PC-over-IP (PCoIP) capability baked into its innards. The Dell Wyse 5123 starts at $629 (around £385 or AUS$710) in the US for the base configuration and is available now. It can also be ordered with a height-adjustable stand and more connectivity options for a higher cost. UK and Australia-based businesses have to contact Dell for pricing and availability. "Stateless" machines like the Wyse 5123 are popular among healthcare, defence, education and other security-consious sectors that require a high level of protection because critical business data and apps are stored on a central server in the data centre, rather than locally. They also house smaller amounts of flash memory, rather than large capacity hard disk drives, making them less susceptible viruses - and more affordable. Unfortunately, being unable to connect to a data centre (or even log into the machine) in Dell's connectivity-challenged conference room, we weren't able to be taken through any of its virtualisation features. We did, however, have a good ogle at its design and ports while pulling at the ear of our on-hand Dell representative to find out more about it. According to the representative, Dell designed the Wyse 5123 to make life easier for IT departments tasked with frequently creating, swapping and maintaining OS images installed on end-users' machines. As such, it comes with support for a wide range of virtualisation options - including Citrix ICA, HDX 3D & 3D Pro, Microsoft RDP 8.0, VMware (RDP) view 5.2, VMware View with PCoIP and Dell vWorkspace. For connectivity, the machine features a total of four USB 2.0 ports (two front, two back), Ethernet, Wi-Fi (802.11 a/b/g/n), SFP, DisplayPort out (for moving to a dual-monitor setup) and one VGA port (for plugging in and using another PC). Those ports allow for three modes of use. Aside from the default mode, there's Dual Display (using DisplayPort to output to another machine) and PC mode (using VGA to connect and interact with a PC). Being a full-HD display, it's a shame that Dell chose not to include a HDMI port for both convenience and the option of hooking up a smartphone or tablet. Additionally, its touchscreen controls proved typically fussy and sensitive under the thumb (what's wrong with tactile buttons? ), which could prove irrittating for those who regularly switch to other sources and between modes. Prise open the 5123 and you'll find Dell's D10DP thin client, which sports an AMD G-Series dual-core 1.4GHz CPU that allows the machine to boot in under 10 seconds. Graphics duties are taken care of by an AMD Radeon HD 6250 backed up by 2GB of DDR3 RAM, which sits alongside 2GB of flash storage. It has all been crammed into one of Dell's 21.5-inch UltraSharp 22 UZ2215H displays, which features a 1920 x 1080 pixel-resolution and houses a 2.0MP front-facing Full HD webcam, integrated speakers and a dual digital headphone/microphone jack. It looks suitably professional and geared for the office, along with its adjustable silver base and stand. Dell says that it's been designed with a low footprint in mind for environments where space is at a premium. Overall, despite not being able to be given a proper demo of the Wyse 5123, we learnt a few things: it's attractive, features strong connectivity options and boots up in the same amount of time as a top-end Ultrabook. The lack of HDMI stands out as an omission. On the other hand, support for Citrix, Microsoft, VMware and a host of other virtualisation suites, added to a high level of security afforded by ThinOS, makes for an all-round attractive package and one that is likely to register on the radars of businesses searching for such a solution.